Home » Health » What Is Larynx Cancer? Larynx or Laryngeal cancer is a tumor that grows on the voice box tissue ( larynx ). The larynx is part of the throat that has an important function in helping our breathing and speech process. This part of the body will also protect the lungs from ingestion of food at the time of swallowing. This medical condition can be experienced by anyone, but men have 4 times higher risk to experience it than women. Laryngeal cancer also commonly affects elderly, especially those aged 60 years or older. Sound changes, for example, become hoarse. A lump or swelling in the neck. Cough that does not heal. There was something stuck in my throat. Difficult or painful when swallowing. Check your medical condition to the doctor if you experience any of these symptoms. Early examination may increase your chances of recovery. The cause behind all cancers is the appearance of abnormal cell growth. The growth trigger is not yet known for certain. Smoke. This is a major risk factor for laryngeal cancer as well as various other diseases. Have or have a family member who has cancer in the head or neck. Experiencing exposure to certain chemical compounds for the long term, such as asbestos dust. The symptoms of laryngeal cancer tend to be similar to other diseases. Therefore, this disease including difficult to detect. In the early stages of the diagnosis, your doctor will inquire about your symptoms and your medical history and family. Physical conditions outside the inside of the neck and surrounding areas will also be examined. CT , MRI, and PET-CT scans . The above examination processes will also help the doctor to determine the stage and extent of cancer progression that the patient develops. Like cancer in general, the stage of laryngeal cancer is also determined by the size of the tumor, lymph node is attacked, and the stage of spread. Small tumors that have not spread to the lymph nodes or other body parts are the lowest-grade cancers and have the greatest potential to be cured. The danger of cancer will increase along with the development and spread. Speed ​​of tumor development will also be a consideration in determining the stage of cancer. Rapid development will increase the spread of cancer that diidap by patients. If you are diagnosed with laryngeal cancer, your doctor will advise you to undergo treatment as soon as possible. Early treatment may increase the likelihood of the patient to recover. Treatment of laryngeal cancer generally includes chemotherapy, radiotherapy, and surgery. Appropriate treatment measures for patients will be determined by the doctor based on tumor size and extent of the spread. Early-stage cancer is sometimes adequately treated with radiotherapy or small surgery. Whereas advanced stage cancer or a large enough tumor usually requires a combination of greater surgery, chemotherapy, and radiotherapy. In general, surgery that may be recommended in dealing with laryngeal cancer involves removal of the tumor during endoscopy and laryngectomy. Removal of tumors in endoscopic procedures is usually recommended for small-sized tumors with an early stage. 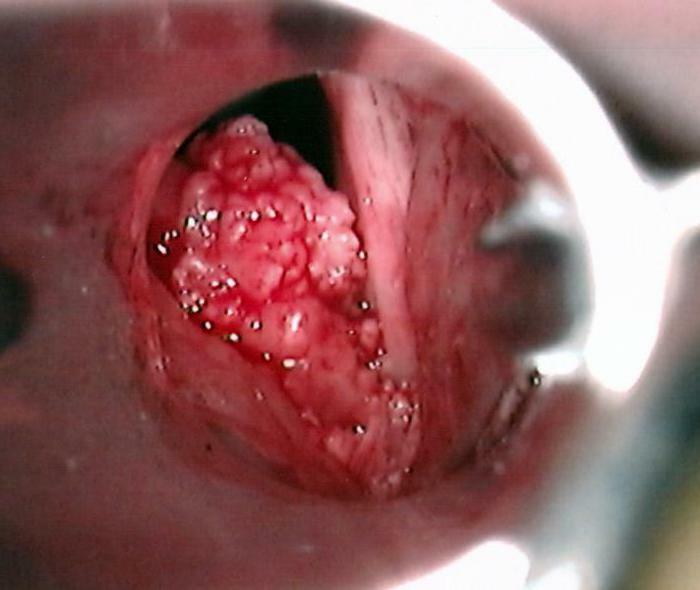 While laryngectomy is advised to treat cancer at a more advanced stage. Partial laryngectomy . In this operation, only a portion of the patient's vocal cords will be lifted so that the patient's speech ability can still be saved. But the patient's voice will turn hoarse or soft. Total laryngectomy . This operation will lift the entire ballot box and the surrounding lymph nodes. Therefore, the ability to talk the patient will be lost. Total laryngectomy will also leave a permanent hole (stoma) on the patient's neck to assist breathing. Stoma hygiene should always be kept free from germs. For patients undergoing a total laryngectomy, there are several steps that allow the patient to regain the ability to speak. One of them by installing a tool in the form of an artificial valve on the patient's neck. Speech therapists will guide patients to familiarize themselves with their use. Just like all cancers, laryngeal cancer also can not be prevented completely. All we can do is to suppress the potential of the risk factors. The main step to avoid laryngeal cancer is to stop smoking and limit the consumption of alcoholic beverages. Limit consumption of alcohol as recommended, in a day is 2 to 2.5 cans of beer 4.7 percent alcohol for men, and a maximum of 2 cans of beer 4.7 percent alcohol for women. Applying a healthy and balanced diet is also believed to help prevention of laryngeal cancer as well as various other diseases. 0 Response to "What Is Larynx Cancer?"